Why do women cut all of their hair off after a break up? I’m not sure… But, I did it, and I regretted it almost instantly. I’ve since spent the last 18 months mourning my longer locks and recently decided to try hair extensions to get my mermaid hair back again and it was quite a challenge. My hair back when it was long. Cue: Research, research and more research. My hair is currently a long bob, just a bit shorter than shoulder length. So I knew that I would need to be pretty strategic about the placement of the extensions to get a good natural look. Each strand of hair on it's own is quite fine, but… there’s a lot of it! I’d need a lot of hair extensions to make it blend naturally with my own locks. Cue first hurdle to fall at. I’d received a funny photo from my friend James, joking that the extensions could look a bit crap if they weren’t done properly… I dismissed the warning and off we went, in pursuit of mermaid length hair. My hair – once described by a passing American man as ‘Blorange’ – after 7 years of dyeing it red/auburn/ginger/copper/apricot and every orangey-red shade in between is no fixed colour. It’s lighter at the ends, and darker at the roots. When freshly dyed it stays a rich copper colour for a few washes and then fades at the ends to a light golden/gingery-blond colour. This meant that it was highly likely that any extensions I ordered would have to be colour-matched to suit. Find out about Clip Hair Limited's free colour-matching service. So what would it be? Salon hair extensions or DIY hair extensions? 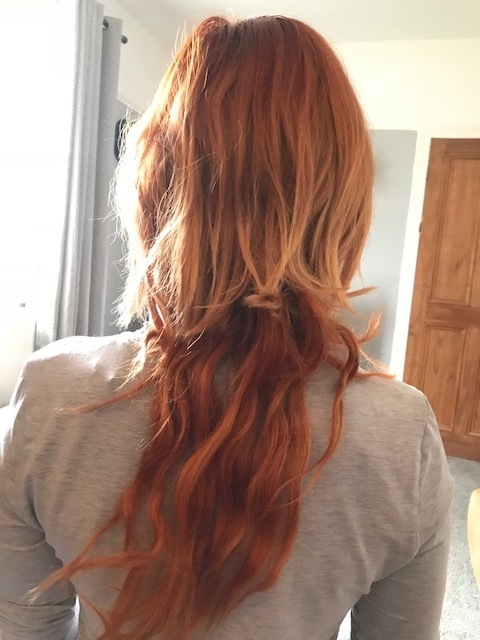 It was in France earlier this year when I purchased a set (100 grams - 40 pieces) of 20” Tape in Remy Human Hair Extensions in shade #30 Light Auburn from Clip Hair Limited, priced at around £80. Once the extensions arrived in the post (which was pretty speedy delivery!) I couldn’t wait to see how they would look! However, I found that they weren’t quite the right shade of auburn for my hair. It’s worth noting that cliphair offer a great colour matching service, where they will either send you samples to compare with your own hair through the post, to help you decide which shade will match best. Or you can send them a photo of your own locks, taken in natural light. I then had to buy replacement blue tape off Amazon (cue another 2 day wait and more money spent £11.95 + £5.99 P&P…) and then I had to re-cut and stick all of the tapes back in place. It was tedious and time-consuming. However, the good thing about Tape In Extensions is that, as your hair grows, you can remove each extension, wash and re-apply new tape, and put them back in your hair. Once back in the UK, after realising that I would be stupid to try and embark on such a hair transformation mission on my own… I ended up making my mum watch a video about how to put in Tape In Extensions and then we set about sectioning off my hair. 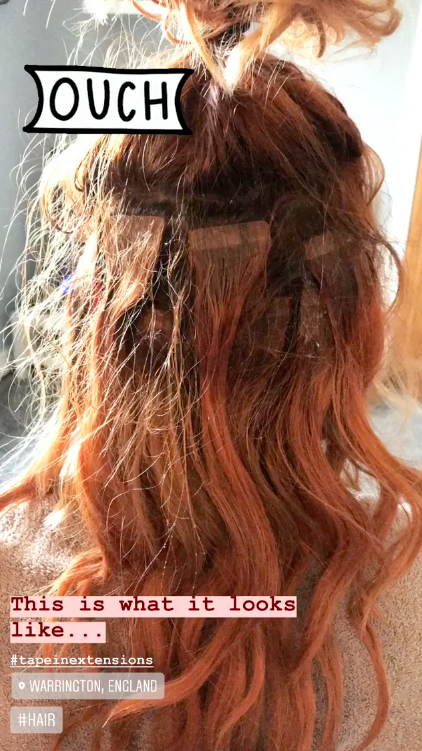 I watched another video on YouTube and soon realised that the girl adding her own tape in extensions, who had achieved a really natural result, had actually used about 100 pieces! That’s 60 more than I had in my possession. Bugger! I quickly plaited my hair, to disguise the mullet-like shelf of a bob (see above pics) that remained unblended, and went to bed grumpy. I became disheartened and knew that I wasn’t going to get the look I wanted to achieve straight away, and after spending so long trying to dye all of the extensions and forking out money for products, I’d lost of all patience and hope of mermaid hair. So much so, that my mum had to spend the next afternoon pouring baby oil onto my roots to loosen the tape and remove every one of the 40 pieces strapped to my head… much to the amusement of a small audience of Instagram Live viewers who were laughing every time I shrieked! Yes, it’s a bit painful removing them tape… not great if you’re head sore. I decided to park my hair goals for a bit, and then a couple of months later I ordered the Clip Hair Limited clip in extensions instead, to see if I would fare better with them. This time around I’d been sent a few different samples of various shades to choose from, and opted for the 20" Double Wefted Full Head Remy Clip in Human Hair Extensions - Ginger Red/Natural Red (#350) (this time with 180 grams of hair). I can honestly say that these are so much easier to work with than tape ins, and perfect if you’re after an instant, dramatic hair transformation. My natural hair is still a bit too thick and short in length to be able to wear my hair down fully with the clip in extensions – I could probably do with another pack... or half a pack, so I opt for the hair up, hair down style, and place the top section of my hair in a bun, or a wear it in a low pony, to blend it better. 20" auburn / natural red / ginger clip in hair extensions before and after using a curling wand to create natural waves. The clip-in hair extensions are so much easier to put in yourself. It takes around 15 minutes max, once you've curled or styled them, to fix all of the pieces into your hair. Because they are human hair, you can wash and dry them as you would your own locks, and take them out when you don't wish to wear them. If you're into sweaty gym sessions, these are perfect! I've mainly been wearing mine half-up, half-down, plaited, in a ponytail or a messy voluminous bun. The great thing about clip in extensions, compared to tape ins, is that you have complete control over how you style your look. I was short on time on my recent trip to Ibiza with Huawei and had to go au naturel with these beachy locks below, but that was also cool, because I rarely wear my hair like this in the UK. My sea salt wavy hair in Ibiza – the colour had lightened too much in the sun to wear my extensions. For more ideas as to how I style my Clip In Extensions, follow me on Instagram @LucieLoves. Disclaimer: Thank you to Clip Hair Limited for supplying the second lot of extensions for me to try, for the purpose of this review. The team have been incredibly helpful and responsive and I would definitely recommend purchasing from them.